What are all the cool queer kids doing this Saturday, August 18th? 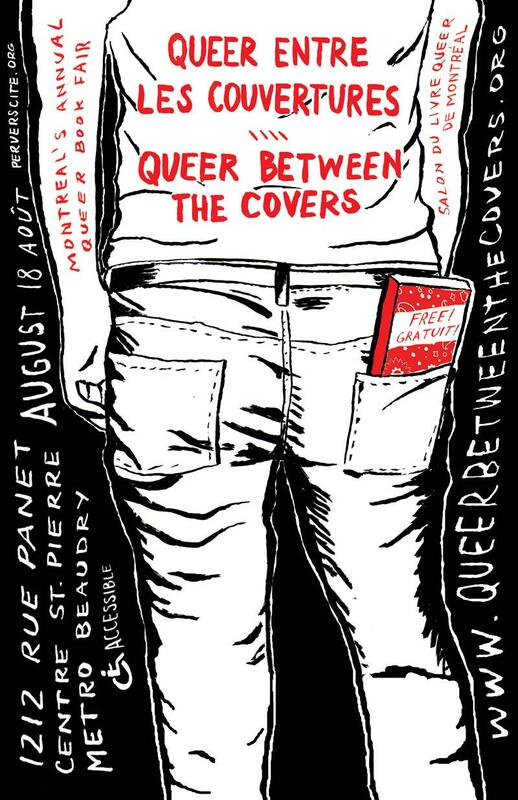 Going to Montreal’s 5th annual Queer Between the Covers / Queer Entre Les Couvertures Bookfair, of course! Running from 11am to 6pm at the Centre St-Pierre – 1212 rue Panet (metro station Beaudry) in room #1205, Queer Between the Covers is a kind of temporary queer bookstore, since Montreal’s last LGBTQ bookstore L’Androgyne closed ten years ago. QBTC is part of Pervers/Cité (in English: Perversity, with a double meaning on cité, which means city), Montreal’s alternative answer to the corporate, mainstream Divers/Cité, aka Montreal Pride. Check out Pervers/Cité’s events for some other really cool stuff, like literary experimentation workshops for queer and trans people of colour, a talk and discussion on queer comics by Oliver Peacock, and a radical Dyke March, among many other rad sounding events! I’m a huge believer in the importance of queer bookstores, both as places to introduce queers to books and authors they might not otherwise hear of, and as spaces for community building, organizing, and activism. I was recently sad to read this article in the Ottawa Citizen about the closing of the queer bookstore there and the generally gloomy situation of our historical bookstores. Can you believe Glad Day Bookshop in Toronto, established in 1970, is the oldest LGBTQ bookstore in the world?? Little Sister’s in Vancouver has only been around since 1982—although I guess that still makes it older than me! Women’s bookstores are also facing some of the same harsh realities—although the Toronto Women’s Bookstore is still going strong! 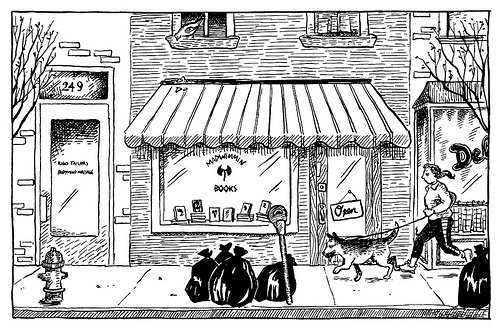 I’m reminded of a certain strip of Alison Bechdel’s comic strip Dykes to Watch out for, where, in response to the closing of Madwimmin, the comic’s iconic women’s bookstore, employee Mo laments “Jeez, I thought we were going to make the world safe for feminism.” Her boss Jezanna replies: “We did. To be packaged and sold by global media conglomerates.” We need to continue to support the people and spaces who made the world safe for queer and feminist literatures! You can do that by checking out Queer Between the Covers, who are trying to fill the void left by these radical businesses such as the fictional Madwimmin Books (based on the late Minneapolis shop Amazon Bookstore); in the words of their website, what QBTC want to do is “provide access to queer materials that are otherwise unavailable in the city, as well as draw attention to the role of queer bookstores in providing community space and supporting queer cultural production.” Couldn’t think of a more awesome mandate than that! Accessibility is also a huge part of Pervers/Cité and Queer Between the Covers: the bookfair will be held in wheelchair accessible space with gender-neutral bathrooms and they’ll have free(!!) vegan food and childcare. The event itself is also free, of course. You’ll find all sorts of different queer materials at the bookfair: zines, books, videos, and other goodies (I assume in English and en français). If you’d like to reserve a table to sell stuff, or volunteer, it looks like there’s still time—see their website for more details. There you can also find pics of cute booksellers from last year! Have a look at the facebook event too. It looks like it’ll be a great time—I wish I could be there! Cute girls, queer books, and that warm fuzzy community-building feeling—could you ask for a better time than that? This entry was posted in Bisexual, Canadian, Erotica, Fiction, Gay, Graphic, Lesbian, Montreal, News, Poetry, Queer, Transgender and tagged books, Canada, Canadian, literature, pervers/cite, queer bookstores, women's bookstores. Bookmark the permalink.